After today’s news, nationally 2010 might go down as the year of high-speed rail, but here in Milwaukee it just might be the year of the Park East. By looking at the economy and listening to all of the talk of doom and gloom one would think this isn’t very likely, but it sure seems that momentum is building in the Park East corridor. 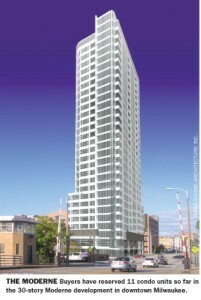 First, up of course is The Moderne, which borders the Park East and is scheduled to break ground in February. This $56 million, 30-story high-rise apartment project received city financing in late 2009 and when built out could serve as a catalyst to further development in the corridor. Another significant project that appears to be advancing is the first phase of RSC & Associates’ Park East Square proposal. This first phase would include a 120-unit apartment building with 4,000 square feet of retail space. Recently it received assistance from the Redevelopment Authority of Milwaukee (RACM) which would issue $25 million in revenue bonds to help the project move forward with the intent of breaking ground in late spring. Although, RSC & Associates have failed to meet ground breaking goals in the past with RACM’s assistance it appears this project is likely to move forward. At a Zoning, Neighborhoods & Development committee meeting in October, 2009 Department of City Development (DCD) Commissioner Rocky Marcoux stated that Mandel Group would be bringing forward the second phase of the North End shortly. As of yet this hasn’t occurred, but with the success of the first phase, combined with Mandel Group finishing up two major projects, Corcoran Lofts and Cambridge Commons, elsewhere in the city this year, they might look to continue their development within the Park East. The $76 million Eco-Square at Park East proposal by Fair Market Development would build out 400 residential units and 10,000 square feet of retail space in Block 22 of the Park East if it were to move forward this year. Unfortunately, as there hasn’t been any recent news regarding this project it seems like the least likely of the projects to move forward in 2010. Finally, Rainier Properties II LLC’s office and movie theater proposal looks promising as Marcus Corp., has formally committed to the $100 million project. The potential time-line for this project probably will push it beyond 2010, as various approvals, financing, and a likely city funded TIF will need to be worked out prior to ground breaking. If it is able to meet those requirements this project could dramatically change downtown Milwaukee for the better. Because, it is one of the key sites in the Park East corridor, would fulfill the long talked about downtown movie theater need, further extend the Riverwalk, and be a socially diverse meeting place that Milwaukee needs. Certainly, there will be plenty of land in the corridor to develop post 2010 and only a couple of these projects will actually break ground this year, but with the addition of new density, new entertainment options, and new office space, it might just be that 2010 is remembered as the year of the Park East. It’s looking good. That Eco-Square project looks like cabrini green, however. I’m all for eco-friendly, but don’t put it in the name! @Nick Aster Yup 10 years down the road people will be like “Eco-” what? Dave- What are your thoughts on the Marcus Theatre area in downtown? Many people are comparing the new complex to Mayfair- and with that the opportunity for an invitation to the criminal element. I have been following the story and so far, and the Marcus Corporation is proposing a “high end” movie theatre. What are your thoughts? @Ken, I’m all for the Marcus Theater plan, it had been talked about for this site for years now really. Will it actually happen? I think it has a pretty good shot, the building has been scaled back from what was proposed a few years ago so I think they really just need one more big tenant, and there are a few major tenants looking for new office space. That said I have no doubt they will be asking for a TIF, so I’m sure there will be a lot of debate about that. I’m not even going to address the “criminal” element discussion. Thanks for summarizing all the Park East activity here. I had forgotten about the Eco-Square proposal. It’s a shame it hasn’t moved forward. But with all the other development in the Park East area, one would think it would help other projects progress a little faster as well.